If you thought Avon’s Supershock Gel Liners couldn’t be beaten, well, I’m sorry, but you’d have been wrong. Sure, they’re soft and creamy and they glide smoother than Torvill or Dean. Yes, the colour intensity is probably among the very best I’ve seen. And uh-huh, yep, they’re amazingly priced at just €8 and outperform products at more than double that price. All that might be true, but they were missing one thing. MORE COLOURS. So far I’ve owned and loved the black version and more recently, the gorgeous Golden Fawn (which you can see in action here). But recently, four more shades have fallen through my letterbox and I am crushing all over them, hard. God, they’re gorgeous. They really are. Just look at ‘em. These four stunners are, from left to right above: Khaki Shimmer, a golden green, Flash, a pink champagne, Aqua Pop, that gorgeous teal and Steel, the shimmery gunmetal grey. I’d use Flash under my eye or in the inner corner, while the other three are gorgeous on the top or bottom lashline, or on both. 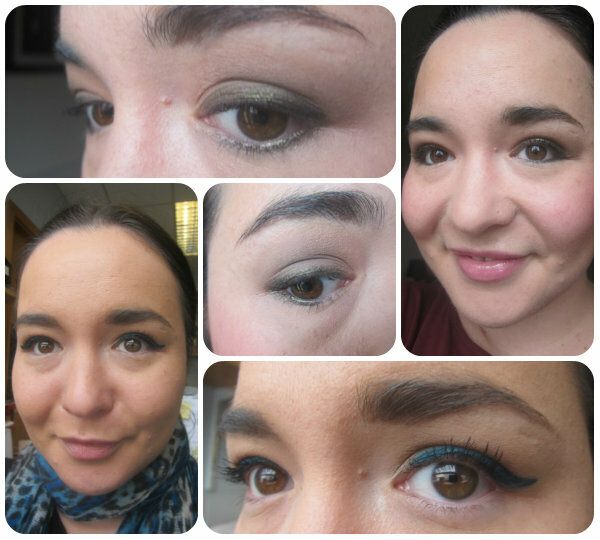 A few snaps of Khaki Shimmer and Aqua Pop in action! The Supershocks are similar to the fabulous Urban Decay 24/7 pencil liners or Lancome’s lovely Le Crayon Kohl but, and I don’t say this lightly, are arguably even better. If you keep them sharp and work quickly you can get quite a precise, winged out line, but they work even better for a lovely smudge of colour round the eyes. You have a little bit of wiggle room but once they set, these babies ain't for budging. Do they have a downside? Well, doesn’t everything? In this case it’s the very softness that makes them such a joy to use – it also means they need a lot of sharpening, and you’ll go through ‘em fast. But without going all Tina Turner on you, I’ve tried hundreds of eye pencils and these ones are simply the best. Snap ‘em up folks – you won’t regret it. Find your local Avon representative here. I love the smudgy look with the olive green shade! Thanks lady - the khaki one is probably my overall favourite though I really love all of them! Totally in love with the Aqua pop! These look gorgeous, I have an obsession with pencil liners. They are fab. The green and teal liners in particular are so pretty. These are now on my wishlist! 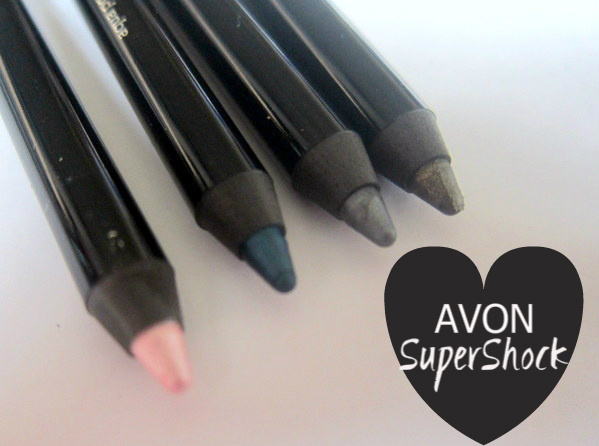 I haven't tried ANY Supershock liners but weirdly I'm really liking the blue shade.. & the khaki.. & now I want them all! Their pigmentation is amazing. Love that they expanded their color range. I definitely have to check these out! I love the colors you have and the wear sounds amazing! I have the flesh coloured one (flash?) and I've just ordered another one as they were only €3,75 in the latest Avon catalogue! Wow, I really need to try these now. I haven't heard of this before and love the concept. The aqua is great on you! I really liked, the colors are beautifull. Do you think with this pencil is easier to learn to make delineated in the eyes? GORGEOUS!! Boy, I hope these cross the pond! and I'm loving the aqua pop so much. It's a shame you don't haѵе a ԁonate button! I'd definitely donate to this brilliant blog! I guess for now i'll settlе fοr book-mаrking and adding уour RSS feed tо my Gοoglе аccount. thіs sіtе with my Facebook group.